Hungarian Ambassador to Ukraine Erno Keskeny has been handed a note that the Hungarian consul in the town of Berehove in Zakarpattia region was declared persona non grata and must leave Ukraine within 72 hours, the Ukrainian Foreign Ministry has said. According to the ministry's press service, Keskeny was handed a note "with the information that according to Article 23 of the 1963 Vienna Convention on Consular Relations, in connection with activities incompatible with the status of a consular officer, the consul of the Consulate of Hungary in the town of Berehove must leave the territory of Ukraine within the next 72 hours." 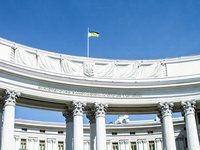 "We hope that the Hungarian side will refrain from any unfriendly steps towards Ukraine in the future and that its officials will not violate Ukrainian legislation," the ministry said. The ministry said that Kyiv views Ukrainian citizens of Hungarian descent "as a unifying factor in relations between the two states." Ukrainian Foreign Minister Pavlo Klimkin said on October 3 that Kyiv would send a note to Hungary on October 4 demanding that the Hungarian consul stationed in Berehove leave Ukraine. "I have urged [Hungarian Foreign Minister] Peter Szijjarto to recall him [the consul]; he has a diplomatic week to do so. If this does not happen and, as I understand it, it will not, we will send a note to Hungary tomorrow and say that he should be removed from office and, therefore, leave the country," Klimkin said at a joint press conference with Moldovan Foreign Minister Tudor Ulianovschi on Wednesday. Klimkin added that no one was going to force the Hungarian diplomat out. "Of course, he will leave the country on his own," he said.